Fit Foodie Megha: 'Chakhna' Collection – Punjab Grill : Munching at its best! — Reviewed! 'Chakhna' Collection – Punjab Grill : Munching at its best! — Reviewed! Punjab Grill is not a new name for food-lovers. The Gourmet fine dine North Indian restaurant is located in Phoenix Market City, Viman Nagar, Pune along with other destinations at Delhi, NCR, Mumbai, Bangalore and Chennai. Punjab Grill, the critically acclaimed brand is owned by Lite Bite Foods, who have more than 12 core brands under them. The place is vibrant yet warm with urban looks and a perfect place for dinner with family and friends. Soothing music in the background, charming Chandelier, bright decor gives a luxurious fine dining appeal. They have newly launched a fancy outdoor seating area; the extended section is a sort of terrace for people to enjoy their meal in the open air with fresh breeze flowing. The area overlooks the courtyard area and a big screen can also be seen for entertainment. 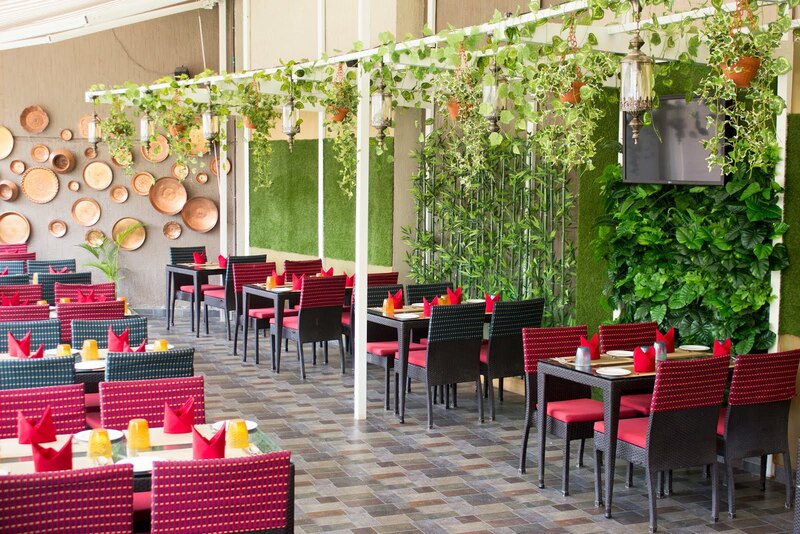 Artificial plants hanging and natural cool air gives a different experience of dining. Live music is also there to entertain one while enjoying meal. 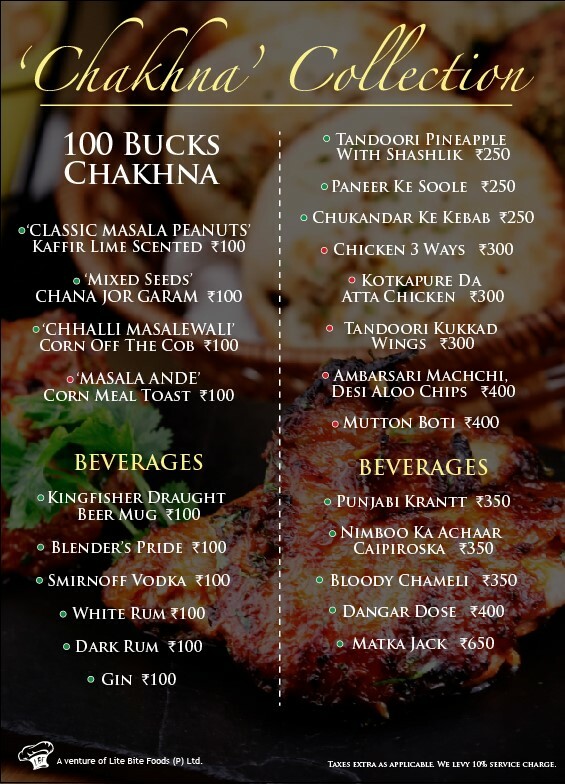 Commemorating their business, Punjab Grill has come up with a pocket-friendly 'Chakhna' menu which is apart from the regular menu. Few of the dishes from the munching menu are starting at just Rs. 100 with innovative snack like Ambarsari Machhi with Desi Aalu Chips, Chana Zor Garam, Kukkad Wings, Kotkapure De Atta Chicken which is suited for the bar. Beverages have a lot of variety of drinks like Nimboo ka Achar Caprioska, Matka Jack, Bloody Chameli with some desi tadka to it! Shots 'Dangar Dose' are offered in a syringe while Jalandhar Express drink is presented in Hukkah style! We started our evening with small portions of 'Chakhna' like Classic Masala Peanuts which had a subtle flavour of kaffir lime. Mixed Seeds Chana Jor Garam was one of the best. It had slight tangy, salty and mild sweet taste which was going well with the drinks. 'Chhalli Masalewali' Corn off the cob, name says, was sweet corn with balanced condiments. Loved it too! 'Masale Ande' with Corn meal toast, a twist given by chef to the spiced scrambled egg with cornmeal roti/toast. It was delectable and a complete value for money at Rs. 100. Tandoori Pineapple with Shashlik was a good starter. Pineapple, capsicums were nice marinated and grilled to perfection! Love the spicy tint of the sauce. Paneer Ke Sooley, again a fascinating dish with excellent presentation! Big Paneer chunks, beautiful marination of onion and tomatoes was balancing the flavours. A very fulfilling dish at just Rs. 250. Worth it! Chukandar ke Kebab, my favourite healthy version of cutlets. Beetroot mash with paneer rolled in bread crumbs and deep fried was one of my much liked dish of the evening! Show stopper of the evening was Kotkapure Da Datta Chicken, a royal non-veg delicacy. Marinated chicken is coated with whole wheatflour and cooked on slow heat. Post baking the coating is cut and cooked chicken is ready to serve. Tandoori Kukkad Wings and Ambarsari Machchi with Desi Aalu Chips were few of the dishes liked by many. Dal Makhani and Veg Biryani was to die for. Aromatic Biryani with succulent veggies tasted amazing with raita. Dal Makhani was perfectly cooked and paired best with tandoori roti. Malai Chenne ka Peda was a surprise dish in the main course. Loved the soft, creamy gravy and silky kofta. It was just melt in mouth. Extremely well made. Our meal ended on a sweet note with Chawal ki Kheer. Small shot of perfectly sweet kheer was very creamy, rich and delectable. Loved every bit! I am sure you would definitely wanna give a try to the lounger with superlative north indian delicacies and drinks. Do visit and share your experiences in the comment below.